I think that it is always good to be honest about one's shortcomings. I am not, by profession, an economist. The amount that I don't know about the theory of economics outweighs the amount I do know by orders of magnitude. Why do I think I can make a contribution to the debate then? Because what I like to think that I am good at is simplifying systems, and the economy is just a system. And it is a system that is not working, and I think that I can see some of the reasons for this. Maybe in some ways it helps to be able to look at things without the framework that is already in place. I am not suggesting that someone with as little experience as me will have all the answers, but I do think that I may be able to help by prodding with some of the right questions. Yesterday, I had a slight argument in the comments section of a post on Simon Wren Lewis's truly excellent blog. I am slightly embarrassed by this as he (and the fictional PK) clearly know a lot more than me and who am I to criticise? However, I do feel that in all of his explanations of the development of the UK economy post 2008, the issue of debt overhang is lacking. He compares the recovery from this downturn to the recovery from every other recent downturn as if they were equivalent and therefore it is solely the fault of government austerity (which I also agree with Simon has been an economically illiterate policy). But in my opinion, the reason why this recovery is so different from the previous ones is that we have suffered from 25 years of monetary economics leading up to this. JK Galbraith famously said, in reference to Milton Friedman advising the Israeli government, "Any country that has Milton Friedman as an adviser has nothing to fear from a few million Arabs." Galbraith was right, but it took until 2008 for this to become apparent and still I feel that the lessons have not been learned. Private debt levels (and thus inequality) have risen to unprecedented levels. In this post here I discuss the empirical cost of the debt - I believe that a 100% of GDP reduction in private sector debt would result in an extra 1.5% growth in GDP every year. It is difficult to overstate the significance of this, if it turns out to be true. In this post here, I explain the mechanism by which conventional monetary policy in the last 30 years has led to an economy with too high a rate of savings to support growth. The model explains the rise in inequality and the current secular stagnation and how it is all part of the rise of private sector debt. Because of the debt overhang, the amount of borrowing that the government would have to do to get back to a normal trend growth is completely unsustainable. The private sector savings rate every year (due to interest payments and dividends being too high compared to wages) is so high that for the government to compensate it would have to keep borrowing too much indefinitely. Eventually the debt levels would get too high and then we would really be in trouble. In any case, the reason I bring up my shortcomings is that after writing my previous post on why unemployment is a failure of the economic system I discovered that there was already a school of (hetereodox) economic thought saying exactly the same thing. To those more knowledgeable in economic thought than myself it will be obvious that this is Modern Monetary Theory (MMT). I also read some criticisms of MMT on Wikipedia, which are therefore criticisms of my proposal, and wanted to counter them. 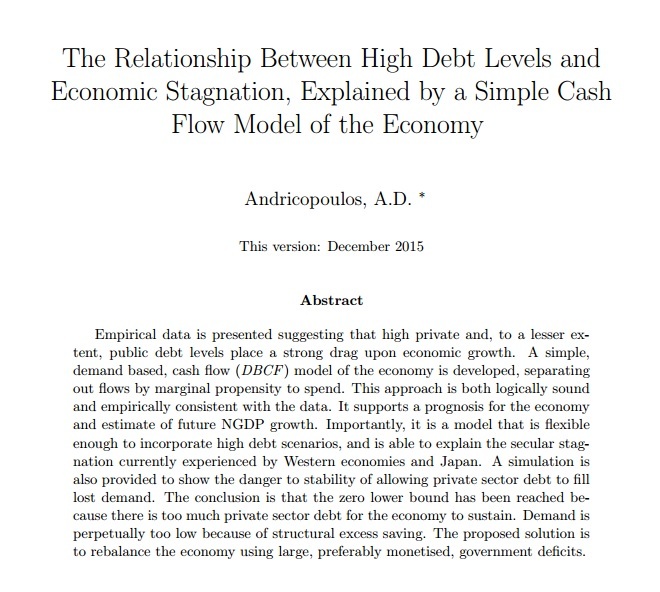 My proposal was based purely on conclusions from my model of flows and what I wish to show is that actually there is no reason to think that economic management by trying to get the right level of private sector debt is in any way preferable to actually printing new money. Just to briefly recap on my model, which is loosely based on the idea of Godley and Lavoie but with the economy divided into savers and workers, rather than into sectors. The savers have savings, which are divided into Central Bank Cash (for which no-one in the economy has a liability), Equity (including houses etc.) and Debt. The liability to pay for all of this is on the future workers. The savings of the savers have no value at all unless the workers of the future will pay them. The workers of the future owe the savers dividends (including rental) and interest. Because the marginal propensity to spend of workers is considerably higher than that of savers, when the dividends and rental are too high a percentage of income then the savings rate goes up and demand goes down. The problem at the moment, as I see it is that we have a huge amount of debt. The amount owed by current and future workers to savers is too high to be sustainable by the economy and still give economic growth. I call the sustainable level 'Reasonably Serviceable Future Liabilities' (RSFL). I believe that the current level of liability of the future workers is much higher than the economy can cope with. For more details on how this works, please see the original post. The New Savings (NS) in this system are given by UI minus the transfer of existing savings to the non-spenders. Note that previously in the post, I equated UI with NS which I now realise was missing out the transfer from current savers. If UI without new money is greater than zero, then, without new money, nominal GDP will go down. And because of the burden of interest and dividends, compared to wages, being too high, this is happening now. And the larger the debt is, the higher the interest payments and the higher the unspent income rate will be (unless we could find a way to increase γ). Assuming that we are targeting real GDP growth of 2% and inflation of 2% then we actually need more money in the system. During the era of Keynesian economics for 30 years after the second world war, the government would regulate the economic growth by using debt issued by the government. This is generally cheap to finance and so does not leave much of a burden in interest payments. In good times the government would not run a deficit and growth would be allowed to reduce the real burden of the government debt. In this time, modern monetary theory and standard Keynesian theory were effectively the same thing. However, in the past 30 years, economic growth has largely been regulated with private sector debt. This, as I show in my post here is a much more inefficient way to stimulate the economy. It has led to huge debt build up and high levels of inequality. The burden of the debt weighs on the next year's economic growth and more debt is required to keep up growth. This positive feedback loop was able to continue until the crash in 2008. And now we are in a stagnation caused by this. I argue that since we can't increase new loans as the cost is too high, the only way to put money into the system is to increase the new cash. This, to me, appears to be basic mathematical logic. More money is needed. We don't want more debt. What else can we do? Looking at the equation, there are other options. One would be attempting to increase the spending of existing savings, maybe with a wealth tax. Another might be to try to force interest rate reductions on to credit card companies, banks and pay day loan companies. A higher income tax at higher levels of income would lead to more government spending and the coefficient of consumption for this may be higher than that of the richer people. But the overwhelmingly more obvious, simple, and easy to control is the printing (and taking away) of new money. So I wanted to look at the criticisms of this idea. New Keynesian economist and Nobel laureate Paul Krugman argues that MMT goes too far in its support for government budget deficits and ignores the inflationary implications of maintaining budget deficits when the economy is growing. Austrian School economist Robert P. Murphy states that "the MMT worldview doesn't live up to its promises" and that it seems to be "dead wrong". He observes that the MMT claim that cutting government deficits erodes private saving is true only for the portion of private saving that is not invested, and argues that the national accounting identities used to explain this aspect of MMT could equally be used to support arguments that government deficits "crowd out" private sector investment. Daniel Kuehn has voiced his agreement with Murphy, stating "it's bad economics to confuse accounting identities with behavioral laws [...] economics is not accounting. "Murphy also criticises MMT on the basis that savings in the form of government bonds are not net assets for the private sector as a whole, since the bond will only be redeemed after the government "raises the necessary funds from the same group of taxpayers in the future".The chartalist view of money itself, and the MMT emphasis on the importance of taxes in driving money is also a source of criticism. Economist Eladio Febrero argues that modern money draws its value from its ability to cancel (private) bank debt, particularly as legal tender, rather than to pay government taxes. I would say that many of these criticisms are based on an assumption that the status quo is a good system and that there is some danger in changing it. I would argue from the opposite side, that the status quo is a dangerous system and that people are unaware of the dangers in the current system. Palley argues that MMT is a restatement of Keynesian economics. I would agree with this, but would argue that it is a necessary one when the traditional tools of Keynesian economics are difficult to use (ie. when the government debt level is already very high and people are, rightly or wrongly, scared of more public sector debt). I would actually argue that there is virtually no difference between this and standard Keynesian theory except that this system does not have any interest costs to the government (and hence the future workers). The government is basically allowed to borrow at zero interest and it only needs to repay if it is economically reasonable to do so. This is completely sensible and in no way more destabilising than the current system, if used correctly. For this reason, I think that criticisms of policy recommendations or instability or danger of deficits or inflation could all be applied to the current system. At the moment, the central bank tries to control how much private money/debt is created using interest rates. Instead it would do the same with public money. This system would need to be executed sensibly and methodically by the central bank, attempting to maintain an increase in money spent each year of 4% (2% growth plus 2% inflation). If this is done reasonably well (and there is no reason to think it would not be - the central bank currently does this with interest rates which is a more indirect method) then the control over the economy and inflation should be better than the current system. To reiterate, there is no more risk of high inflation with a sensibly executed MMT policy than there is with the current system. In fact, due to the direct effect of printing money, rather than the second order effect of using interest rates to try to control private creation of money, I would argue that there is less risk. In terms of crowding out private sector investments, I think that Murphy's idea is a theoretical and bogus argument similar to the 'confidence fairy' argument that austerity would bring growth. In bad times, when people are spending less, the government would spend more/tax less. In good times they would spend less/tax more. The good and bad times here are exactly when the private sector would be reinforcing this cycle with expansion and retrenchment of their own. This is why Keynesian theory is so important. Kuehn's argument that accounting is not economics seems very flawed to me. Of course economics needs to have accounting identities. Everything must add up correctly - it is impossible for it not to. Any economic system which ignores accounting identities needs to be seriously questioned. Overall, I feel that the case for modern monetary theory to take over from the (very similar) standard Keynesian approach is very difficult to logically refute when you look at the accounting identities and the stocks and flows in the economy as they are. Functional Finance is about managing the economy *today* for *today* because the future is uncertain. If you save there is no guarantee you'll be able to spend those savings on anything real in the future. There is no firm promise there. The paradox of thrift is a double edged sword. If people over spend the economy by running down savings in aggregate they will be taxed more to fit the spending to the available production. If people under spend the economy by running up savings in aggregate (the normal condition) they will be taxed less to fit the spend to the available production. And instead of taxing less/more the government can simply spend more/less - depending upon the propensities. Increasing lending reduces space for government to spend/cut taxes. Decreasing lending increases space for government to spend/cut taxes. That's Neil. A fascinating subject, I am finding. I wouldn't take Wikipedia too seriously on this. MMT gets a lot of extremely unjustified 'straw man' criticism from either people (generally from the right) who abhor the idea that government can create 'funny'/'unsound' money or from orthodox economists who are too lazy/egotistical to investigate it seriously. Steve Keen is not one of the latter and is very close to MMT. I'll admit, as a layperson, I was put off by the badmouthing for a long time before taking the plunge. Here are two rebuttals to Thomas Palley's critique a couple of years back from leading MMTers Randy Wray and Bill Mitchell..
Two excellent responses, far more informed than my own. The power of consensus is just so big, isn't it? Anyone starting again and looking at the system of money creation would surely not choose the current system as an ideal. And yet MMT gets dismissed as irresponsible. You are right about the right wing ideological angle too, I think. As it is primarily a description of how the monetary system works, MMT is actually politically agnostic. The received wisdom that 'government is broke' suits conservative narrative. On the other hand 'progressive' parties have no chance at all of making any meaningful progress without MMT. Think of the Greens in the current UK general election continually hounded by the question "How are you going to pay for it?" They try to answer the question by stating that their manifesto is "fully costed", which, in the very act of answering, they validate the question's false framing (that government budgets are 'like household budgets'). In other words they've lost the argument before they've begun. Though they've shown not a jot of understanding so far, I'm intrigued though that - because, like MMT, they see the economy as part of the real world (not the other way around) - the Greens are perhaps the only party left that might just 'get' MMT. Nice presentation. I have posted it on my facebook page for none of my friends to watch (but I can try).